Sometimes, it's little details that make me feel like the author really wants me, the reader, to get it--and make me feel like I've gotten ahold of a great little secret. In Selling Hope by Kristin O'Donnell Tubb (Macmillan - Feiwel & Friends), the detail that got me was the setting of a party on the roof of the Palmer House hotel. Hope and her father are traveling vaudeville performers, but Hope really just wants to stop in her home town of Chicago and stay there, so she starts selling anti-comet pills to unsuspecting folks who fear Halley's Comet. I had a very old ARC of this, passed on by a friend, and it's interesting to see the iterations the cover went through--my copy looks very old-fashioned, and this might be an easier sell, if a less evocative one. 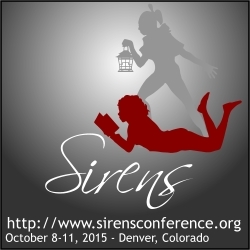 Pair this with A Drowned Maiden's Hair by Laura Amy Schlitz, which I was sure I'd reviewed here, but I guess not! 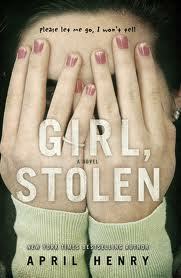 The other recent stop-and-pay-attention moment came in Girl, Stolen by April Henry (Macmillan - Henry Holt BFYR). I haven't finished the book; it's a new rotation into a spot in my house where I sometimes need something to do for just a minute, so I only read a few pages at a time (there are a lot of spots like this in my house, car, purse...). Anyway, Cheyenne has been kidnapped by Griffin, who just stole his very first car, and when the radio reports on Cheyenne's disappearance, there's an ad for Burgerville. Burgerville is a real thing in southwestern Washington and northwestern Oregon, and while I know most readers won't realize that, won't know how that chain is part of the landscape, I was really tickled. Wow, do I have a lot of reviews to catch up on. I'm always surprised by this, because I feel more and more that I don't have time to read--I do, but this spring and summer brought many eye-straining activities, so it's more that I need to make ergonomically friendly time to write! I'd also like to finish my travel posts before it's been a year since I went to Australia. And, of course, I'd like to make more time for reading other blogs, something that my much-curtailed-of-late online time hasn't allowed. 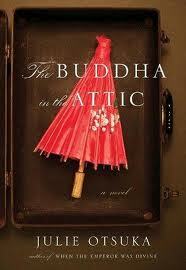 So, then quickly: The Bhudda in the Attic by Julie Otsuka (Random House - Knopf) was a gift. I got it in paperback (the cover with the woman on it), but isn't the hardback cover intriguing, too? 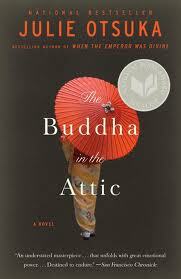 The hardback gives more of a hint of what the 2001 National Book Award finalist is about: the emigration of Japanese picture brides to the United States in the early 20th century. While not very long, the book manages to--cleverly--tell hundreds of stories via plural-first-person POV (think Greek chorus). Instead of I, it's we. Otsuka did a lot of research to create the stories, all told at the same time, of women, and by extension, of their families and struggles. I found it tough to read, at times, because of the harshness of (at least some of) the stories, as the women found their way into farm work and, later, to internment camps, but also very poetic and beautiful while addressing identity, erasure, and culture. The voice won't be for everyone; I just now looked at a few reviews, and saw that some readers felt it read more like a laundry list--so as with any review of mine, YMMV.